We present the fully automated pipeline we have developed to obtain electrophysiological simulations of the heart on a large atlasbased virtual population. 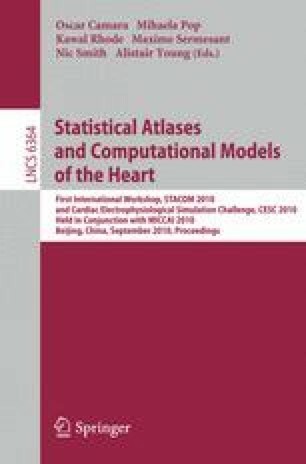 This virtual population was generated from a statistical model of left ventricular geometry, represented by a surface model. Correspondence between tetrahedralized volumetric meshes was obtained using Thin Plate Spline warps. Simulations are based on the fast solving of Eikonal equations, and stimulation sites correspond to physiological activation. We report variations of total activation time introduced by geometry, as well as variations in the location of last activation. The obtained results suggest that the total activation time has a strong dependence on LV geometrical variation such as dilation-tohypertrophy.